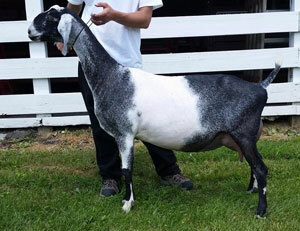 When I first saw pictures of Emphatic's dam, Bliss' udder, I was immediately drawn to the height, width, and attachments that are far too often not seen on nubians. 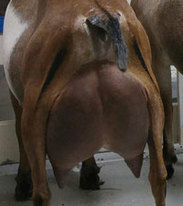 Her fore udder is smooth and well attached. She is a young doe, who is still very immature and developing, but has alot to offer already! She has tight, sharp shoulders, and tons of potential! This genetic cross of Joy with Chaos, son of the 2012 National Champion, then mixed with familiar and consistent Kori-Brook lines gives us much hope of a good cross with our herd! 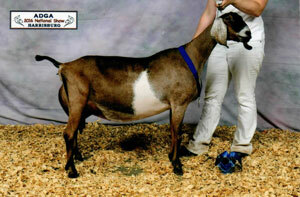 I could not be more excited to use Emphatic in our herd!